The billionaires and politicians that clinked champagne glasses at the annual World Economic Forum (WEF) charade in Davos tried, as usual, to project concern about the world and those outside of their bubble. The WEF public relations machinery ensured that the event was slick and that there were panels on climate change and inequality. But the hypocrisy of elites was clear for all to see. Not only that, this year even some of their usual supporters in the mainstream media said that the global elite is currently out of enthusiasm and ideas. Opening the conference, David Attenborough urged world leaders to take serious action on climate change, but the attendees broke the record for the number of private jet flights that ferried them in to the luxurious Swiss ski resort. This, despite WEF’s own report on global risks for 2019 showing that environmental threats are seen as the biggest danger to the world. The disconnect is quite staggering, and further proof that Davos generates nothing more than empty rhetoric and bloated media coverage. Another disconnect moment, now rightly gaining infamy on social media, saw our Fight Inequality ally Winnie Byanyima of Oxfam, alongside historian Rutger Bregman, tell some badly needed home truths to billionaires – that they need to be taxed more, and about the reality of work without dignity that so many people endure around the world. A reality check that Davos Man was unwilling and unable to face up to. Whilst Davos played itself out for another year, the leadership required to face up to multiple, urgent challenges that we desperately have to address was coming from elsewhere, including from a sixteen-year-old climate activist. Thunberg is part of a growing global movement of students demanding urgent change from their governments. Their protests are exciting and vital. In the face of urgent social problems not being addressed, other grassroots movements too have emerged during the last few years. From students demanding ‘fees must fall‘ in South Africa, to the global me too movement demanding an end to sexual assault and violence against women. These are examples and reminders of an important historical lesson: that all social progress, from the fight against apartheid to securing women’s right to vote, came about by the power of the people challenging the people in power. And so it is with inequality, ironically also identified by the Davos elite for several years as one of the greatest risks facing the world, and a subject that remains on the WEF agenda. Unsurprisingly, nothing has been done about it by Davos. The policy prescriptions and solutions are thoroughly researched and well-known but rejected by the plutocrats and politicians in order to maintain the status quo and the economic system that benefits them. Of course, the idea of elites ‘solving’ inequality is absurd – given that the problem is of their making and its perpetuation in their interests. The statistics on inequality bear testament to this. Wealth is becoming increasingly concentrated – last year 26 people owned the same wealth as the 3.8 billion people who make up the poorest half of humanity. Currently the wealth of the world’s 2208 dollar billionaires is now five times the GDP of the whole of Africa. In the UK, the average FTSE 100 CEO takes home 133 times the salary of the average worker. We are dealing with a worldwide inequality crisis that is reaching new extremes and undermining global efforts to end poverty and marginalisation, advance women’s rights, defend the environment, protect human rights and democracy, prevent conflict, and promote fair and dignified employment. Even Davos Man knows this. But what the elites at Davos again made clear, through their rhetoric and inaction, is that only a grassroots movement will fix this. A growing global movement called the Fight Inequality Alliance – comprised of trade unions, social movements and leading international and national non-profit organisations – is busy organising while those at Davos eat canapés and mouth platitudes. While the 1% gathered in the Swiss Alps, activists and campaigners held a week of action calling on governments to curb the murky influence of the super-rich who they blame for the Age of Greed, where billionaires are buying not just yachts but laws. Community groups’ ideas, which elites don’t mention, include minimum living wages, an end to corporate tax breaks, higher taxes on wealth, capital and profits of the richest companies and individuals to enable quality public services for all, and a limit to how many times more a boss can earn than a worker. 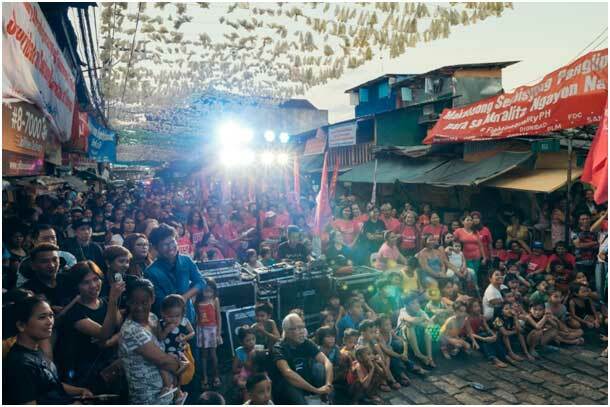 From Nairobi to Manila to Guadalajara, to Delhi to London and many countries beyond, tens of thousands gathered in slums and towns across the world in contrast to the opulence of Davos, putting forward their solutions to inequality and celebrating their resilience through music, theatre and cultural expression. Ultimately, the solutions to inequality will come from those who are at the frontlines of it, not the 1% that caused it and continues to benefit from it. And as anger about shocking levels of inequality continues to grow, so will the movement to fight inequality. Deflated by its own duplicity and by the movements mobilising people power outside of it, Davos is a gathering in search of a purpose. The real power for the radical and systemic change we need is with ordinary people coming together and organising to demand it. It’s what has worked in the past and it’s the only thing that will work now.